ALBUQUERQUE, N.M. (AP) — Some critics of the forced separation of Latino children from their migrant parents say the practice is unprecedented. But it’s not the first time the U.S. government has split up families, detained children or allowed others to do so . Before abolition, children of black slaves were born into slavery and could be sold by owners at will. Black women could do little to stop the sale of children and often never saw them again after they were sent away. Owners also split apart parents who had no legal rights to prevent their sale. To resist, slave families regularly ran away together but faced harsh physical punishment, even death, if caught by slave hunters. Last week, both White House press secretary Sarah Huckabee Sanders and Attorney Jeff Sessions cited the Bible in defending the policy of forced separation of Latino migrant children. Sessions referenced Romans 13, which urges readers “to obey the laws of the government because God has ordained them for the purpose of order.” The same passage was cited before the Civil War to justify slavery, to allow slave hunters to return runaway slaves to their owners and to pull slave children away from mothers. At 150 or so Indian schools around the country, officials made Native American children cut their hair and outlawed all Native American languages. They forced children to adopt Christianity and attempted to “Americanize” children by introducing them to white customs and white history. Native American children returned home almost unrecognizable to their parents. Still, some children resisted the boarding school experience by setting fires to buildings, running away or taking their own lives. Others continued to speak their native language in secret. Some Navajo “code talkers,” who used a code based on their native language to transmit messages in World War II, were products of military-style boarding schools as children. During the early 1900s, states sometimes pulled children from poor families and placed them in orphanages. But reformers in the 1920s and 1930s began promoting the idea that children should not be separated from their families, according to “In the Shadow Of the Poorhouse: A Social History Of Welfare In America” by Michael B. Katz. However, local and state authorities still used poverty as a reason to take children away from Native American and black families, National Association of Social Workers CEO Angelo McClain said. Sometimes the ordered separation came over concerns about a parent’s mental health. Malcolm X in his autobiography recalled welfare workers coming to take him and his siblings away as children from his struggling single mother after their father, an outspoken black preacher, was mysteriously murdered. The future civil rights leader lived in various foster homes and boarding houses. His mother, without her children, had a breakdown and was sent to a mental institution. During the Great Depression, local authorities in California and Texas participated in a mass deportation of Mexican immigrants and Mexican Americans whom they blamed for the economic downturn. Between 500,000 and 1 million Mexican immigrants and Mexican Americans were pushed out of the country during the 1930s repatriation, as the removal is sometimes called. Many families felt they were being forced to separate from their children, who were U.S. citizens. 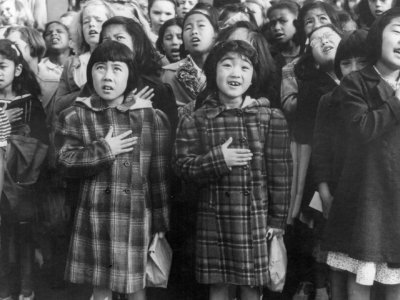 Starting in 1942, when the U.S. was at war with Japan, around 120,000 people of Japanese ancestry were ordered by the U.S. government into prison camps around the country. An estimated 30,000 were children. The 1999 documentary “Children of the Camps” highlighted the trauma children faced while being detained with their grief-stricken parents. Some older children waited to turn 18 so they could volunteer to fight for the U.S. to prove their families’ loyalty despite not wanting to be separated from their parents. Diaries and later interviews show many of those who went into the military did so reluctantly. Kiyoshi K. Muranaga, whose family was interned at Granada Relocation Center in Colorado, joined the U.S. Army but was killed in Italy. He was posthumously awarded the Medal of Honor by President Bill Clinton. Associated Press Writer Russell Contreras is a member of the AP’s race and ethnicity team. Follow Contreras on Twitter at http://twitter.com/russcontreras . See AP’s complete coverage of the debate over the Trump administration’s policy of family separation at the border: https://apnews.com/tag/Immigration .